We’ve been known to stomp around and throw a fit at the sight of a dead cell phone or iPod battery. UK telecom giant Orange has seen the connection between dead batteries and moving feet, and they’re making good use of the energy that we all produce by simply walking, dancing, or even stomping. The boots were developed by Orange and renewable energy company GotWind in an effort to create solutions for keeping people connected while at the Glastonbury Music Festival. 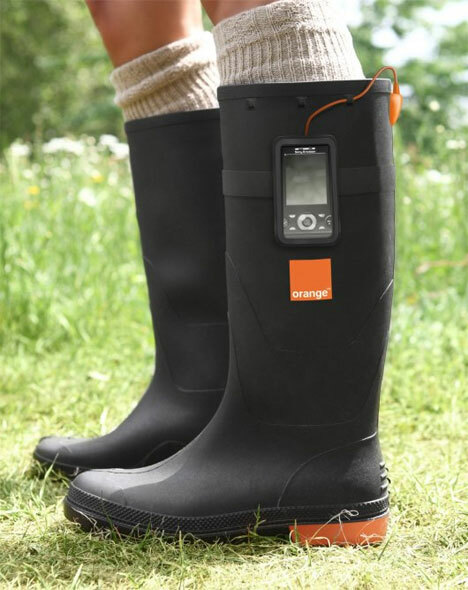 The Orange Power Wellies – named after the much-loved Wellington boots seen on just about every foot at outdoor events in the UK – charge up phone batteries with nothing more than the heat from the wearer’s feet. The boots use the Seebeck Effect to transfer temperature changes directly into electricity. The boots use a small battery to store the accumulated energy throughout the day. At the end of the day, the user can simply plug his handheld device into the boots to charge it up. Don’t count on getting a full battery with this method, though: you’ll have to walk for 12 hours to generate enough juice for just one hour of battery life. But you can speed up the energy generation by making your feet hotter (like by running or dancing) or by walking in colder environments, since it’s the difference between the temperatures on the inside and the outside that generates electricity. See more in Energy & Power or under Science. June, 2010.